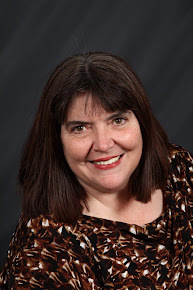 I have been wrestling with my latest romantic suspense and sometimes not winning the battle. Finally after a lot of bruises and cuts, I think I've come up with what I want to do in the rest of the book. I think you can tell I'm a seat of the pants writer. But as I was plotting out the story, I kept coming back to the question what makes a story a suspense. I would love to hear what others think makes a suspense. I need a sense of danger. It doesn't always have to be on the page, but the feeling needs to be there that danger lurks just waiting to strike. I however have to throw in a mystery element, too. I need a puzzle to solve. So what do you like in a romantic suspense? Don't forget that if you comment your name is thrown in for the monthly drawing for the four current Love Inspired Suspense books. Schools across America are closing for the summer over the next few weeks. My kids came home with their summer reading list and it got me thinking about what books I want on my summer reading list. I always have a huge TBR (to-be-read) pile of books so I always fight with myself about buying new books. But summertime is a great time to stock up. Years ago I used to love taking books on vacation with me. When I traveled, I had a couple of books in my overnight bag to keep me company during down time. I usually ended up buying more. This year I have a bunch of books on my list. Aside from checking out a few of the new Love Inspired Historicals and some of my favorite LIS authors, I'd love to pick up another Karen Kingsbury book and maybe another Dee Henderson. I've been meaning to try a book by Loraine Snelling. (Can you believe I've never read one by her?) I had the opportunity to meet her last year and she was such a hoot! What's on your summer reading list this summer? Drop me a post and let me know. I could always use a few more books on my list to keep me company. The Other LI Suspense Releases in May & Giveaway! I'm back! Sorry, but the birth of my third child waylaid me in the middle of this month. Isn't she cute?!?!? Fortunately, Abigail and Jonathan adore Rebecca. They are actually a huge help, but that's not what you came here to read about. So let's talk suspense! This month in addition to my book -- YEAH! -- and Robin Carroll's Bayou Justice, there were two other releases in the Love Inspired Suspense Line. Those are Ginny Aiken's Danger in a Small Town, and Lenora Worth's A Face in the Shadows. Here's the teaser on both of these books. Danger in a Small Town: She was supposed to be safe. Someone had broken into Tess Graver's home and trashed the place. But this was no random robbery. The intruder was looking for something specific -- but what? With her own secrets to keep hidden, Tess reluctantly turned to neighbor Ethan Rogers for help. The been-there, seen-that former DEA agent wanted nothing to do with the big-city crime from his old life. But Ethan wasn't about to let the dangerous thugs take over his small town. Or scare strong, sweet Tess into running away -- no when he'd just found her. A Face in the Shadows: Did he kill Josie Skerritt? Everyone -- including the police -- suspected Parker Buchanan of the ten-year-old murder. But Kate Brooks knew the brooding loner couldnt' have do it. He was her young son's hero, and Kate had fallen hard for the reclusive author. Town gossips demanded Parker explain the incriminating evidence police found with his initials on it. But Parker couldn't. Kate knew proving his innocence would take all their faith -- and fast thinking-- combined. Because the real killer was setting them up for a double murder -- their own. I have copies of May's four LI Suspense books to giveaway. To enter to win, leave a comment to this post or any from May 28-31. Tell me where you find Love Inspired books or why you like to read them or other suspense. Good luck! Week 15: Layer it on! Equating the layers to story arcs might also work. Steeple Hill Love Inspired Suspense books, which I write, have a suspense arc, romance arc and faith arc. I think of them as threads that weave through the story. Each should have a beginning, middle and end, and the resolution for each should be satisfying. The threads carry more weight or play a more dominant role at various times in the story, and the resolutions do not necessarily coincide. In other words, the hero and heroine might realize they love each other before the danger escalates; thus, the relationship in the romance arc may resolve long before the climax of the suspense arc. Maass notes that layering involves multiple problems affecting the hero. He also mentions that layers are connected by “nodes of conjunction,” which he’ll talk about in lesson 16. Now let’s look at our own stories and count the plot layers. In my current work-in-progress, I found four layers for the heroine and three for the hero. Was there another thread I needed to pull through to round out the story? After reflecting on what I’d learned in this lesson, I identified a fourth plot line for the hero, which should provide a more satisfying resolution. Check your story. Do you have three or four distinct plot lines that thread through your book? If not consider the onion and layer it on. Over the weekend I read an article in an airline magazine on my way to Fort Lauderdale about a project that Microsoft was involved in. It’s the high school of the future. The library doesn’t have books that you can hold in your hand. Everything is on the computer and all the students have their own laptops. They don’t have textbooks. My blog today reflects sleep deprivation on my part. Why? Well, I'm one of those people who loves pets and even though I have 4 teenagers, I consider my pets my babies. Unfortunately, my pets think of themselves as people and therefore deserving of sleeping in my bed. After spending a good portion of yesterday, I went to bed at approximately 12:30 AM. At 1:30 AM my dog decided to join me in the bed. My dog, a 7 year old beagle named Nike, is small so you would think he wouldn't take up a lot of room. WRONG. He sleeps like a person, on his back with arms and legs spread out, taking up as much as the bed as he can claim. And while I always insist that he sleep at the foot of the bed, somehow he ends up snuggling with me in the middle of the night and I wake up to his furry face. I love him, but not his dog breath. If his dog breath doesn't wake me, it's his whine at 5:30AM to go outside. Then there is my 14 year old cat, Keturah. I always wondered about her name. It's very old fashioned. I actually googled it once and found a whole bunch of women named Keturah from the 1800s. If anyone knows the meaning of it, let me know. Keturah came to live with us when she was 7 years old. She had an owner who was single, no children and traveled a lot. Her previous owner felt she needed more attention so she moved in my house with 4 children who at the time were ages 6, 7, 8 and 9 and she got more attention than she ever wanted. Truly. She hid beneath my desk for 2 years and only came out at night. Usually around 2:00AM to wake me up and say hello. I'd wake up to one of two things, either the play-with-me purring noise right in my ear or a crazy screech that means one of two things, feed me or there's no more water in my bowl! They usually come around 4:00 AM. It's my own fault. I spoil my pets. And make no mistake about it, they own me, not the other way around. It does leave me with less sleep than I use to get when my kids were babies. I think I can manage to get one full sleep cycle in between animal calls. So forgive me if today's blog is a bit off. I'm sleep deprived and need more coffee. Ever been to a readers’ luncheon? 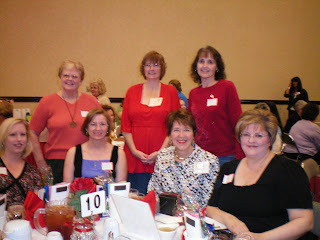 The Heart of Dixie Chapter of Romance Writers of America hosts a gala event each May in Huntsville, Alabama. Fellow Steeple Hill author, Missy Tippens and I left Atlanta Friday morning and drove to Huntsville, arriving in time to check into our hotel – the beautiful Embassy Suites in the heart of downtown – before we headed to the main library for a bookseller and librarian tea. We spent the afternoon talking books and enjoying the delicious finger food HOD provided, thanks to Andrea’s catering. That evening we had dinner at the Jazz Factory. I sat next to Roxanne St. Claire and across from Sherry, Stephanie and Jean – HOD gals who I’ll be seeing again at the RWA Conference this summer. We got back to the room in time to call our hubbies and wish them goodnight before we turned out the lights and got a good night’s sleep. The next morning we gathered in the lovely Van Braun Center where each author was assigned a table. I brought goodies for the gals who would sit with me – cute notepads and note cards, a Craftie Ladies highlighter/pen and chocolate as well as copies of my latest release, MIA: MISSING IN ATLANTA. The doors opened at 11 A.M. and eager readers swarmed into the room, finding seats at their favorite author’s table. Dianne Hart, Rachel Lewter, Anita Mays and Dawn Eby joined me, and it was wonderful chatting with them. A special treat was having two dear friends who I’ve known for years come to the luncheon. Alice Mingo and I lived across the street from each other at Fort Polk, Louisiana. Dorothy Newman was a neighbor at Fort Irwin, California. Seeing them brought back so many memories of when kids were young and so were we! Thanks, Alice and Dorothy, for being there for me on Saturday! HOD luncheon chairman Kathy Bone also sat at my table. Kathy’s a beautiful woman who did an excellent job organizing the event. Lunch was delicious, and Kathy and the other HOD members made all of us feel so welcome. Thanks, Kathy! You and your committee did an outstanding job! After lunch we got to hear Roxanne St. Clair talk about her life as a writer. Rockie is a doll! She’s upbeat and outgoing, and she never meets a stranger. An added plus for the weekend was getting to know her better. Following her speech, drawings were held for the author baskets. Mary Freeman won mine! 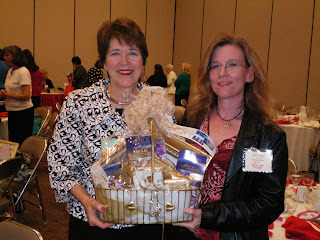 More baskets—all piled high with books—were given as raffle prizes, and five lucky people at my table went home winners. 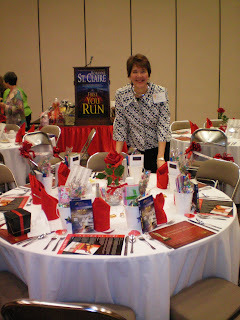 A booksigning followed the luncheon and the proceeds went to aid literacy. 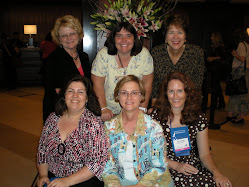 If you’ve been to an HOD function you’ll know the gals from the Writing Playground (www.writingplayground.com). Marilyn Puett, Kera Sinclair, Danniele Worsham, Kimberly Lang, and Alexandra Frost worked throughout the weekend to ensure everything was flawless. Thanks for making it all look so easy! HOD divas Linda Howard, Beverly Barton and Linda Winstead Jones presented Kim Kerr, writing as Kim Lange, with flowers and a charm on the sale of her first book. Kim organized the bookseller and librarian tea and is the go-to gal for every HOD function I’ve attended. It’s great to see her hard work pay off with a sale to Mills and Boon! Southern Magic ladies and dear friends, Carla Swaffard and debut author Christy Reece, with a three-book contact to Ballentine, were there as well as librarian Irene Charles and her sister Sarah. Missy and I hated to say goodbye to Huntsville friends, both old and new, but we had a long drive home. Of course the miles flew by since we had so much to talk about as well as plans to make for next year when we’ll be heading back to Alabama for another Heart of Dixie Readers’ Luncheon. Hope to see you there! Today we're welcoming KATE BROOKS, the heroine of A Face In the Shadow--May 2008, part of the Reunion Revelations continuity series . Wow, you've just had quite an adventure. I grew up in Magnolia Falls and went to Magnolia College. I wanted to be a singer, so after I graduated I went to Nashville, got married and had my son Brandon. But the singing career and the marriage didn't work out so I went back to school to become a neo-natal nurse and I moved back to Magnolia Falls to be close to my family (for my son's sake--his father isn't the best role model.) After I returned we had a class reunion at Magnolia College and that's where I met Parker Buchanan again. We were best friends in college and I can admit this now--I always had a crush on him! But Parker is a reclusive comic book writer, so even though we saw each other at the reunion I didn't talk to him for a while after that. My son is a big fan of Parker's comic book hero--Patchman. Brandon wanted to invite Parker to his birthday party, so I got up the nerve to go to Parker's estate and well .... after sneaking in and being chased by his two German Shepherds, Parker and I talked and he turned me down--refused to even consider coming to the party. But he showed up at my door later (with lilies) and offered to throw the party at his house! After that, things were going great until the police came to the party and took Parker in for questioning on this ten year old homicide case--(a body was found buried on the college campus and Parker knew the woman who was found there--Josie Skerritt.) Now the police thing Parker killed her! 2. So, during the book you met Parker. Tell us a bit about him. What was your first impression? When did you know it was love? As I said, I knew Parker in college but he wasn't like the other boys. He was shy and quiet--a real James Dean type. But he was my friend. Then he was in a horrible car wreck (with another student--Penny Brighton) and he refused to see me after that. The accident damaged his leg, so he still walks with a limp. My first impression of him after spotting him across the room at the reunion was, "Wow, he looks great--like a character right out of a Jane Austen novel." I also realized I still had a crush on him. Now that we've finally found each other again, I know God met for us to be apart so we'd mature and appreciate each other more. I just hope he will be cleared of this horrible crime, because I know in my heart Parker didn't kill Josie. My greatest strength is my faith. It has helped me through a horrible marriage and an awful divorce. Sometimes I wonder if I made the right decision--and I believe I did--for my son's sake if nothing else. Brandon needed the stability of a family and friends and we didn't have that in Nashville. I now sing at church and I love working with the tiny babies in the neo-natal ward. My weakness is my impulsive nature--that led to running off to Nashville and marry the wrong man. I'm trying to learn how to be less impulsive but sometimes that still gets me into trouble--such as when I was so determined to talk to Parker I practically broke into his estate! Something happening to Brandon or my family and--what if I lose Parker all over again? I don't want to lose him this time. But we can't move forward until this murder is solved. I'd try to trust my heart but I'd also be more cautious and less impulsive with my feelings. That's hard right now with Parker. I have always had a strong faith and I believe God will see us through this crisis. My prayers have held me together through so many things. My faith has never wavered. My faith only grows stronger each day, because God has given Parker and me a second chance and we've weathered the worst--a murder, Parker being accused of that murder, gossip and doubt from my family and friends and a killer who is determined to get revenge on Parker, even if that means committing another murder. If God can see us through all of that, then we were meant to be together, right? This passage is important because throughout this murder investigation, we all felt that someone was out there in the shadows--someone sick and evil who wanted to punish each of us for the past. But as I tried to show Parker, God wikk help us overcome that evil, that face in the shadows, so we can walk together in the light of His love. That is my one prayer--to be with Parker and raise my son with our faith shining brightly! I will continue to pray that all will be revealed and those shadows will disappear so we can finally be a family. Secret Agent Minister--Finalist Gayle Wilson Award of Excellence!!!! Thank you so much Lenora Worth for sharing Kate with us. I know I look forward to reading A Face in the Shadows. Next week we will have a contest to win one of the fabulous May Love Inspired Suspense books, so please stop on by. Here: Yesterday afternoon I had one of those epiphany moments. I was sitting in the living room with my son watching Noddy (children's cartoon) when suddenly I did a swept of my living room. I looked at the curtains. They no longer close all the way thanks to Mikey's constant opening and closing. Continuing south, I saw Mikey's little rocking chair with a Dapper Dan in it (the doll you use to teach zippers, buttons, etc). Then, there's my antique rocking chair (given to me by my uncle who lived to be 97!). Sitting in that rocker is a giant Winnie the Pooh bear and Curious George leans against him. Next comes my Grandfather Clock. In front of it is a blue bean bag chair that Mikey likes to drag to the middle of the room to settle in while he watches T.V. Finally, there's the entertainment center. It used to be a Martha Steward piece. I have special knick knacks there. Now, I see children's videos. On top are the things I take away my Mikey. I see a car; I see puzzle pieces. I stop my sweep. I don't need to look any farther to know that God has given me what's known as HOME. There: Yesterday I emailed my agent my new proposal. It's for a three book series. You'd think I'd be comfortable sending off a three book proposal but I'm not. This proposal is revised per suggestions one month ago. I wonder how my little proposal stands up? Does the editor look at it and think, "Boy, you can tell this one's a beginner." Doe she look at it and think, "Surely, somewhere there's a book on putting together proposals and this author will someday find it?" or, as I suspect, will the editor look at my proposal and say, "I hope it's good." I surmise that I worry about the packaging and that my editor worries about content. Everywhere: Last week I had an excuse as to why I hadn't read Robin's LIS. Walmart didn't have them in stock yet, and I'd just joined the bookclub but hadn't received a shipment. This week should have been so much better. I went to Walmart on Saturday. New books are there! I grab all four. I'm really looking forward to Lenora's because I've been reading the Reunion series (am actually all caught up-finished Carol Steward's just last week) and Lenora's is next to last. I get home. Then, Saturday night I go to pick up Lenora's book. I didn't buy it. It gets worse. I pick up the top book from the stack and think "Hmmmm". Yup, it's from the previous month. Now, I'm not completely lame. I did know what was coming, so I quickly look at the others. Yup, for some reason at Walmart, they restocked three of the four new ones, and left one stack of the last months. I had two of one book. Arg. Such is the life of a writer: here, there, and everywhere. What great weekend! I just finished a manuscript yesterday and took it to FedEx, which meant this was a weekend to play! So after church last night, my husband and I went out to dinner. And today, I spent most of the day puttering around in the barn and then riding Tucker for a few hours. We have one geriatric hayburner who is too arthritic and gimpy to ride (though oddly enough, he can sure race around bucking and kicking, when he thinks no one is watching!) and Tucker--a younger horse that we bought from author Cindy Gerard a few years ago. Her husband raises beautiful horses, and Tucker is sure a sweetheart. And now--I get to tackle my TBR pile. I can't wait to catch up on all the latest books by the authors here. Robin's new one (there's a review here, if you page down) sounds absolutely intriguing, and so do the others!! 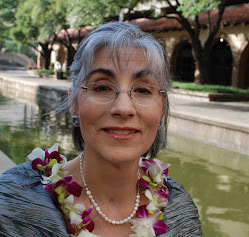 I've been reading Debby Guisti's blogs with much interest as I'm a big fan of the Donald Maass workshop. Sometimes I find myself falling back on old habits and I need to remind myself that there is a process to writing a book that I should never rush. I'm not a heavy plotter. In fact, my plotting is basic at best. I'm a puzzle/pantser writer. I can write a 15-20 page outline that will give me a roadmap as to where I'm going with the story. But there are two other steps that have always been essential for me to "get into the head" of my characters and create that roadmap. If I skip them, I'm in trouble. The first process is letter writing. I tell people in my workshops that I'm a big fan of not "reinventing the wheel" so I have to give credit to Robin Lee Hatcher for this technique since I got it from an RWR article many, many years ago. I take each main character in my book and write a first person letter in their point of view to me. I start out when they were a child, i.e. I was born in Tulsa, and go all the way up to when the story begins. I've gotten a lot of good information that rounds out my characters and gives them personality just by writing this way. The second process I use is placing all my plot points into a 4 Act structure chart. I use the Syd Field screenwriter's workshop that I learn years ago from attending a workshop author Pat Grasso did at a conference. It was one of those transforming moments in my writing because I found I could really see the progression of my story and fix any holes I had before I started writing. I find that when I skip any one of these steps in the beginning stages of my writing, I get myself and my story into trouble. Lesson learned and reading through Debby's post made me realise I need to get back to basics. Bayou Judgment is the third book in Robin Caroll's Love Inspired Suspense series. If you haven't read the first two, go pick this one up...you are in for a treat! Phone counselor Felicia Trahan desperately needed to dial in to the Christian Crisis Hotline. She'd come home to her apartment to find Jolie, her roommate and coworker, dead. And few clues to the killer's identity: There was a shady boyfriend. A rival at the crisis center. And disturbing phone calls from a distraught young woman who was becoming increasingly unhinged. So much so that the center's tough-guy pastor feared for Felicia's safety. Spencer Bertrand promised to protect her, even if he lost his heart in the process. Yet drawing out a killer hiding in the Louisiana bayou could be the only way to save them all. This book was one that I couldn't put down from the first page to the end. Felicia is desperate to show everyone that she can stand on her own after a lifetime of being sheltered. Yet, when her roommate is found murdered, her family and friends want to shelter her. Spencer wants to be honest with her about his past, but is afraid of what her reaction and the rest of the town's will be if it comes to light. Felicia wants to help others, but finds that this one caller becomes more irrational with each call. And she seems to know things that strangers shouldn't. When the police's investigation dead ends, Felicia is determined to jump in and do her part to make sure her roommate's murderer is brought to justice. Despite the cost there to her. The character's are real with flaws and strengths. They interplay between Felicia and Spencer is filled with potential potholes without any promise that all can be worked out. And the suspense is intense. Strange things keep happening. Yet the more they do, the more stubborn Felicia becomes. And there is no question that this book could happen anywhere else. The bayou is an integral character, and Caroll does a masterful job weaving in details without overwhelming the readers. If you're looking for a great suspense filled with romance and twists, then I highly recommend this book. Let’s take another peek into WRITING THE BREAKOUT NOVEL WORKBOOK, looking at what Donald Maass has to say about complications. Pulling out just a few key lines, we learn “…no goal is achieved without overcoming obstacles…[obstacles] are the essence of plot.” No surprises there. But remember Maass is referring to all blockbusters. Yes, definitely suspense but also romance and women’s fiction as well. Whether internal or external, the complications make the characters struggle. Nothing comes easily, especially in the bigger book. So the writer must pile on problem after problem after problem while increasing the stakes until the reader—and perhaps even at times the writer—wonders if the hero or heroine will succeed. Maass cautions to make the situations believable. Authenticity requires ensuring the antagonist is fully developed. A challenge, which most writers, according to Maass, fail to accomplish. Due in part, he suggests, to the fact that writers are not bad people. Try as we might, our villains often fall short because we don’t understand the inner rational of the truly evil mind. So this week, let’s dissect our villains. What makes him or her tick? Why is he dead set on stopping the hero and/or heroine? What’s his inner motivation? What core values—flawed though they may be—shape him? Is he a believable character? What about the difficulties facing our hero, will our reader “buy” into them as well? Now examine the problems you’ve already introduced into your story. Can you intensify the complications? More is usually better when it comes to conflict, so compound the situation. Make the hero fight for his life against a powerful adversary and stack the deck against him. Make the reader sweat. With nails bitten to the quick from worry, the reader should see no possible way for the hero to succeed. But of course, he will in the nick of time, with all the odds against him, because you’ve applied Maass’ breakout techniques and your story is better for it. 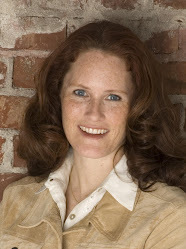 Today we're welcoming Felicia Trahan, the heroine of Bayou Judgment, May 2008. Wow, you've just had quite an adventure. Well, I never intended to be in any such situation, no. Looking back, I probably should have asked and accepted help more than I did, but I so wanted to be independent. After what I've been through, I've sure learned my lesson. 2. So, during the book you met Spencer Bertrand. Tell us a bit about him. What was your first impression? When did you know it was love? My greatest weakness is tending to believe the best about everyone, even when a person is proven to not be what they seem. My strengths and skills? Hmmm. Guess that would be that I believe God is always with us, and I try to share that with everyone I meet. Not being able to care for myself again. After spending most of my life in a wheelchair, and now having experienced the liberation and freedom from walking on my own, going back to the way I was terrifies me. That I'd had the surgeries a LOT earlier in my life--that I'd have stood up for myself and what I wanted. Oh, I've always loved Jesus and been His follower, but I just wanted to do so much on my own. I hope it shows that I'm stronger in faith, relying on God for direction before jumping out on my own, yes? This particular Scripture applies more to Spence's faith than mine. So many people today, even Christians, are so quick to judge others. But we all must trust in God, because ONLY HE knows the heart of a man. Taffy--because I'm sweet, can be pulled in a lot of different directions, but when my focus is on Him, I always come back together. Thank you so much Felicia for joining us today. I'm looking forward to reading Bayou Judgement. Please join us next week as we have the heroine from Lenora Worth's book A Face in the Shadows telling us about her adventures. Today is the first day of my summer vacation, and here's the truth, teachers look forward to it as much as students. If Walmart had stocked Robin's book, Bayou Judgment, I'd be reading it! Instead, I'm looking at my office - time to clean again; looking at my stomach - time to diet again; looking at my computer - time to write again. What am I reading? I just finished a fabulous book called The Other Woman. It was about a newly married woman and her mother-in-law. The author, Jane Green, made me feel part of the family, friends!!! How did she do that? I'm staring at the book I'm working on Lost Identify (please sell) and wondering just how Jane Green zapped me out of my world, put me into hers, and made me care. What am I going to do to my office? This morning I started on one corner of my desk. I threw away revisions for the book that came out in March. Yup, that's right, I still had notes in a folder. Tossed. Goodbye, etc. I think I'll work on another corner in a minute, then I'll glance at the stacks. Oh, and the big thing I'm doing today is renting one of the wetvacs. I'm cleaning the carpet. What am I doing to do to my computer? Gut response: turn it on, but since I never turn it off, that answer will not do. I love my computer. This morning I worked on getting Robin Carol's information up. 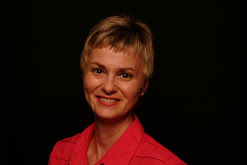 She's a fabulous writer and I love her photo. I read her first book and it took me back to New Orleans: the scenery and the scents. I love her locale. My favorite memory of New Orleans is riding on a boat and throwing marshmellows to the alligators. Who knew alligators loved marshmellows! It's interesting being the one in charge of the blog. Robin dutifully sent me her photo and cover, which my computer immediately said was corrupt. I, however, knew that my computer was lying! I resent the file she sent me to myself, and like magic, not corrupt. Took care of that problem. The next foil my computer tried was typing in Bayou Judgment. First of all, I misspelled it. I typed Bayou Justic. I think I was going for justice and got distracted. I fixed it. Yup, I fixed it by typing Bayou Judgement. As an English professor, I can tell you the debate on whether that middle E belongs is heated! But, the bookcover is a killer counter argument, so dutifully, I went back in and took out the E.
In a moment, I'm filling out a sheet for the Seekers blogsite. I will be a guest there. Then, my son Michael (the second most popular name in the U.S. again!) will wake up. It's going to be a great day. So great, btw, that I think between filling out the Seekersville info and Mikey's awakening (not a word btw), I need to go spend a moment with God thanking Him. Scroll down a bit--and see the happy news about Cara's new baby--just yesterday! What thrilling times those are when one is addng to their family. I so loved the years when we had our little ones coming--three who got to come home--over the years. What an unbelievable treasure. I'm so happy for Cara and her family! Writers sometimes talk about about how writing a book is like having a baby--all those months of hard work, and struggle, and then comes the joy of seeing that book on the bookstore shelves. But really, the two events aren't even in the same ballpark. What could be more thrilling than bringing home that little blanket-wrapped bundle that hold so much wonder and excitement, so many possibilities? Mega-congratulations to Cara. I hope we'll get to see some pictures here on the blog sometime soon! Book Cover and Exciting News! Check out the book cover for Her Only Protector August 2008! I'm always excited when I get a new book cover. It means the book is on it's way! Let me know what you think. Her Only Protector is the follow up book to Cradle of Secrets and features Dylan's younger sister, Sonny, as she goes to Colombia to rescue Ellie from the head of the Aztec Corporation. She meets a bounty hunter who ends up getting in her way and making a whole lot of trouble for her. It's fun book! I also have excited news about Cradle of Secrets. I got a call yesterday that Cradle of Secrets received the Award of Merit in the 2008 HOLT Medallion contest. I'm thrilled. Several other Love Inspired authors also received the awards so I feel like I'm in good company. What's a girl to do when she finds a dead body in the theater box next to her own? Especially when she's a reporter and she owns the story? Follow through and investigate, of course. But it comes at a cost to Dani Richards, and that fee just might be her own life. Enter Caleb Jamison, the cop assigned to the case. He's determined to protect Dani, but they have a history. A past littered with pain, betrayal, and broken trust. Can he keep Dani safe while protecting his heart? Dani is a woman torn--the sense of responsibility and loyalty to her aunt, the pain she's endured from the past with Caleb, doing her job, and following up on the story. I felt her inner turmoil as she turned so many corners, only to be faced with more conflict. Caleb is a changed man from the boy Dani had known years ago, and is determined to prove that. I related to his struggles--work, love, and facing the mistakes of the past. In Cara Putman's first suspense novel, she proves herself as a writer who can spin twists and turns to keep the reader flipping the pages. I was intrigued by the hero and heroine's past, as well as the suspenseful plot that kept throwing the two flawed but learning characters together. With a strong supporting cast (who I hope to see in future installments), this book is a great read for romantic suspense lovers. Looking for a great vacation read? This is a book I'd recommend you slip into your carry on-but be warned, you'll not want to put it down until you've read the last page, landing or not! Today we're welcoming Dani Richards, the heroine of Deadly Exposure, May 2008. Wow, you've just had quite an adventure. You’re right. It’s not an adventure I would have planned, but it kept things exciting and changed my life. My mom would say I grew up looking for trouble. Being a television reporter who covers the crime beat for a Lincoln, Nebraska, station just confirmed that bent. But really, I went to the theater to get a night off, forget about work. Instead, I discovered a body and couldn’t stop investigating until I knew who had murdered Renee. 2. So, during the book you met Caleb Jamison. Tell us a bit about him. What was your first impression? When did you know it was love? Caleb and I actually knew each other and dated a bit in high school. Let’s just say it didn’t end well. Frankly, he was the last person I wanted to spend anytime with. When I saw him come up the stairs at the theater, I was not pleased. But he was the investigator assigned to the case, so I had to work with him. The amazing thing was over the course of that crazy week, I was able to see how much he had changed. I also discovered that my feelings for him weren’t as dead and buried as I thought. Love is an amazing thing. It developed when I least expected it, and I couldn’t be happier now. I’m a tenacious gal. Don’t ever tell me I can’t do something, or I’ll do it just to prove you wrong. And that tenacity is a great trait for a reporter. But sometimes I take that to far. Caleb’s never going to let me live down Renee’s case. Not being able to help someone who needs it. An inability to ferret out the truth. Wow, you don’t ask easy questions. I may have to remember some of these for my interviews! I’ve always wished I was tall. Instead, my height is very average. I don’t like to be average in anything. I also wish I had never wandered away from God. Fortunately, He is gracious…and I love having a fresh relationship with Him. But it does make me regret those missed years. I had closed that door firmly. I believed God had abandoned me years earlier. There are many reasons for this, but now I know none of them were valid. 7. Where are you in your faith at the end of the story? Do you have a life verse? I’ve rediscovered God and am so glad. He’s becoming my best friend. I still have a lot to learn about Him, but He has definitely proved to me that He is faithful and a shelter in the storms of life. I wouldn’t still be here if He hadn’t saved my life. 9. If you could be a dessert, what dessert would you be? Why? I LOVE snickerdoodle cookies. Kind of crazy, isn’t it. During the week I was stalked a kind woman kept plying me with snickerdoodles. They were almost as delicious as the ones Aunt Jayne made for me when I’d spend summers with her. I love to bake them – just the basic Betty Crocker recipe, but nothing tastes better than a perfectly baked snickerdoodle. Thank you Dani for taking time to talk with us. Deadly Exposure sounds like a fabulous read. 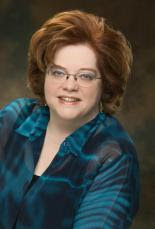 Next week look for another fun interview with the heroine from another fabulous Love Inspired Suspense novel. Posted by Pamela Tracy on behalf of Terri Reed. I’m a die-hard suspense reader. Sure, I grew up reading the classics and all the wonderful writers of my parents’ generation. Anyone remember James Michener? As a young girl, I spent a summer immersed in HAWAII and THE SOURCE. Every book he wrote, I read. Daphne de Maurier’s REBECCA was a favorite. Leon Uris and Edna Ferber’s works as well. But over the years, especially as the desire to write full-length fiction took hold in my life, I focused primarily on suspense. James Patterson, Tess Garritsen and Harlan Coben are on the top of my to-be-read pile today. Two months ago, a group from church—all gals with whom I attended a church retreat called Christ Renews His Parish—decided to form a book club. Jodi Picoult’s MY SISTER’S KEEPER is this month’s read. It’s an intense story about a family spiraling out of control. One daughter is dying of acute promyelocytic leukemia, and her parents used genetic embryonic selection to produce a sibling who is a perfectly matched donor for the sick child. Now the donor daughter is old enough to consider her own health and her right to refuse being her sister’s lifeline. Written in first person but with at least seven point-of-view characters, each “person” in the story has his or her own chapters as well as a personalized font. Yes, you read correctly—the font changes depending upon the POV character. And it works. 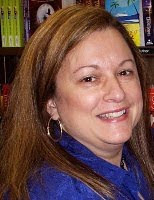 Without a hitch, Picoult establishes each character as unique and compelling with distinct issues—think goals, motivation and conflict. For a number of weeks my Wednesday blogs have focused on Donald Maass’ WRITING THE BREAKOUT NOVEL WORKBOOK. Many of the techniques he discusses can be illustrated in Picoult’s work, but one stands out above the rest. Maass challenges writers to incorporate universal truths into their stories. Picoult takes it to the extreme by giving the reader a teaching on life in each scene succinctly written, like an essay on the human condition only in fiction form. Ms. Picoult’s deep insights provide a satisfying punch over and over again. A master storyteller, Picoult's well-drawn characters take on multiple roles in the story as she ups the conflict, pours on the emotion and stretches the tension and reader anticipation. Turnabouts and surprises, escalating personal stakes and larger-than-life characters—all hallmarks of a breakout novel—establish Picoult as a blockbuster author. Wonder if she took a Maass workshop or read his book? Pick up a copy of MY SISTER’S KEEPER. You won’t be disappointed. PS: Post a comment and let me know your favorite authors! This week, the Craftie Ladies is honoring one of its own: Cara Putman. As I sit here thinking about both her and her book, I keep coming back to the "What it Takes?" And, I have one answer: time. It's 6:44 at my house, and I'm up writing. Writing because right now I'm not on contract and I want to be. Not being on contract could mean sleeping in. But, if it meant that, then subliminally, I'm telling myself that the next contract is a chance, a maybe. I've never believed in taking that route. I know in order for me to get a new contract, I've got to have proposals in. To have proposals in, I have to devote time. Cara, too, knows the value of time. 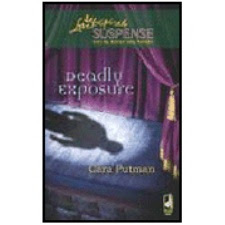 She put time into writing Deadly Exposure. How much time, Cara? My first LIS Pursuit of Justice took about seven years to write. Not because I wasn't willing to write on it everyday, but it seemed that every time I started working on it - and it was so very different than what I was selling to Barbour - I sold something new to Barbour. The next two LIS took four months each to write. So, Cara, how much time did you take writing Deadly Exposure? And, what is your next LIS and did it take the same amount of time or different? I'm counting down to the end of school. I'm subbing in a classroom while the special ed teacher is on maternity leave. I'm eager to get back to writing full time. I got used to it the three months I was retired. I hate wishing my life away, but I'll be glad when May 23rd arrives. Have you ever counted down to an event? In a suspense I've used that technique to up the suspense in the book. Not that waiting for school to be over is really suspenseful. One of the most suspense movies was D.O.A. where the man had a day to solve his own poisoning before he died. Now talk about a countdown. What books or movies have you seen where there was an exciting, suspenseful countdown to an event? Oh, and I almost forgot. Buried Secrets (October 2007 Love Inspired Suspense) and Vanished (May 2007 LIS) were finalists in the Golden Quill Contest. I was part of the first generation of home-schoolers in Nebraska. My love for politics and the law grew in part out of several trips to the Unicameral in Lincoln to defend the right to homeschool. Watching the attorneys in action caught my attention and imagination in a way that stuck. My earliest involvement in politics was the Reagan-Bush campaign in 1980. I was all of six, but my mom took a picture of me and my siblings at the time standing around a yard sign. Some interests begin young! I started college at sixteen -- I've always been an over-achiever I guess. But I LOVED the environment and challenge of college. That's probably why I enjoy teaching so much now. My first book (written as a teenager) was about the Lost Colony of Roanoke. The true-life mystery of what happened to that group of people captured my imagination and wouldn't let go. I still think it would be a great book, but you want to talk about outside any kind of brand I'm trying to build! I love Runzas, a Nebraska delicacy. If you've ever had one then you understand what I mean. My mouth is watering as I type this! Yummy!!! 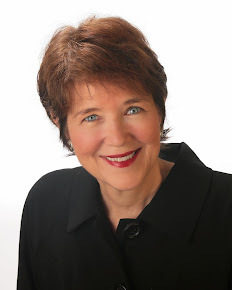 Colleen Coble at Girls Write Out and if the other girls want to play, that would be even more fun! Crystal Miller, another Indiana friend who blogs at the Chat N Chew Cafe and When I Was Just a Kid (great site for author interviews). 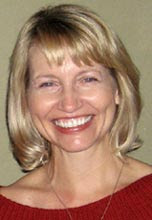 Robin Caroll, who has a great Love Inspired Suspense coming in May and another in June. And my sister Janna Ryan, over at the Cornhusker Academy.